Another interesting chart (but I doubt that we can gat it), would be the number of darwins with high capital that have failed. Anyway the only manner for darwinex to show that the concept works is to make public investors portofolios in gain. Regarding the fault of traditional investors, then it is my fault also, because I am one of them. And I think that you are almost with me, because I remember that you had a minimun equity in your rules to invest, hadn't It? As investors we dont' have to be fair, we have to be profitable. As you pointed out with your last reserch, a filter on equity makes sense. Clearly such filter will leave out the (very few) skilled traders working with less than 1000 but our goal is to make money not to talent scout. With all these comments and charts that I have been sharing I don't try to convince anyone of anything. My objective was to make a pragmatic aproach to analyse the circunstances that Darwinex had to take the decision. I do not want to burn anybody, simply I share what I have found, and now I can have my own opinion. 2) Investors are less attracted to invest in lower equities darwins. Less than 1k equities have 7% of the total investment. 4) 60% clients that attract 7% investment, and surely I can guess that their trader comissions generated are lower than this 7%. Can they survive with a limited number of good traders? 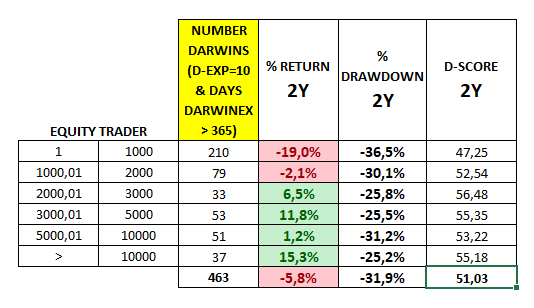 It seems to me that MOST of the total investors on Darwinex mainly concentrate on Top 50 or so DARWINS. I think when this month end, we will see if actual total allocation is more than 4M or less than, I donot have exact and precise numbers but I feel maybe less, if this will be the common senario in future, I hope Darwinex can put a bit more for potential pool of allocation so making actually total prizes around 4.5M as before we have guranteed 4M....or maybe can get 4.5M fixed, but extend to 61....ranking Darwins,if the top 60 cannot consume the 4.5M, still maintain a incentive to invest more in Darwin accounts. Did the traders have the $2000 or more since they opened the account or did they put additional money in their equity after they got better returns? It is very understandable you put more money in your account when you have good returns...doesn´t it make sense? And if it does, those charts would be wrong too, right? Anyway, I am agaisnt this change for one reason. 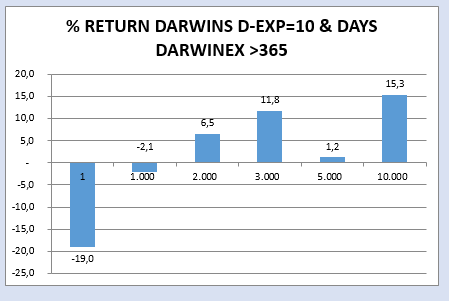 Darwinex yelled very strong for years that Darwinia was the big difference between them and the rest of brokers. They say in Darwinex any trader regardless the equity had the same opportunity to play the big leagues based in meritocracy that was basically evaluated by D-Score (the big thing). Now that statement is false. Darwinex has not deliver what they promised. And this is the point for me, they have lost credibility. Honestly, Darwinex have been increasing Darwinia´s pot along the years, and more and more darwins got the opportunity to get AUM, that´s been amazing. Nobody asked for that, but they did it and it´s been very appreciated. Also they have made some changes along the way, that is fine (or maybe not), but everybody still had the same opportunity and conditions. Now, this change is completelly different. This new turn is breaking the principles of Darwinia, where equity is rewarded (equity is not a skill). We are talking about investors here, but we are forgetting this change has nothing to do with investors, it is for Darwinia, so this change is related to Darwinia prizes and Darwinex risk. Investors have their own rules to invest, some will see the equity while others won´t care about it and will check other parameters. And anyway every investor is free to put their money whatever they want, right? So, why Darwinex is doing this change breaking all the promises and principles they started with? The reasons they have given don´t convince me, do they convince you? That is the point, the traders KNOWS that his strategy works and it is not just luck. Who knows the strategy and its quality better than the trader? If a traders keeps trading peanuts with a decent trackrecord it means that there is something wrong. What doesn´t mean that those traders had worse performance when they had smaller equity. But it is just a fast analysis of the charts. Anwyway, I am against this change because Darwinex has change de game, the game they started with and what they promised to the world. Now Darwinia is not giving equal opportunity to everybody, that´s not fair, and that´s my point on this matter. Many people will be really dissapointed. Clear, but when equity was lower the trust of the trader was lower, even if the strategy is the same. I agree with this, it is not pleasant and not fair but it is necessary, because too many guys are here just to play the game of darwinia, now they have to decide if they want to make business. I feel it is very unfair. They could have changed the parameters as they did before. Like averaging the three last months, or limiting the amunt of darwins per account, etc. But giving everbody the same opportunity. Meritocracy is based on skills and hard work. Lately there was too much luck in winning a big darwinia prize... with many darwins that were running with a few bucks on them... for me this depend on the fact that Dscore don't look at the past and so if you have 1000 bad darwin a few will suddenly have a nice year and a very good month (and so winning a big prize). Rising the trader's equity is a PATCH to this scheme... but not the solution also because it will be clear that a lot of the 4.5 million will not be allocated. Who will be put aside are those who are not skilled enough to have a long term return and those who don't believe in their system or strategy. Maybe what happens is that a person who makes systematic withdrawals of capital needs it to live. If you have peanuts, you know that's not good enough to live. But with Darwinex, peanuts are your work tool to obtain higher yields. On the other hand, I still think that critical data such as the capital of the underlying account or the monetary yields obtained should not be published. In my opinion they are private data. In fact, when this platform began, that information was not made public. Right but how much likely is this situation? They also have said when a strategy manager invests his own capital that this will instill confidence in the minds of the investors. Now this will be true for some, and not true for others. Traders, too, will think differently about this. What real difference is there between $1000 with $3000 or $4000? Not much. But as for the hedge fund industry, managers are usually required by the big investment firms to re-invest a certain set percentage of their own profits each year, as a way to show investors that the manager will put their capital and profit at risk in his own strategy. Their commitment did not have a time limit. Their business is now evolving and responding to the current day. I know that businesses must do this, and if we want to participate we must trust that this change is necessary and beneficial to everyone. I do, though, understand the annoyance. Every company has a mision and a vision. Darwinex mision was to welcome all small traders to give them a fair and unique opportunity to play the big leagues, an opportunity that nobody else out there was giving them. It was amazing, and the ONLY reason many traders came to Darwinex. Darwinia was created for them, everybody regardless the size of the pocket could compete (with the rules established by Darwinex) having EQUAL opportunity to reach the prizes. They were the principles and the commitment Darwinex made with the traders. I understand principles and commitments can´t change ever. I believe those are ethic issues, and ethics don´t change either. That´s why Darwinex had succeed. There is not other reason, people didn´t come because they had the best commisions, fees, etc...no, the ONLY reason was Darwinia and the AUM opportunity that now has been amputated. This is my point of view, it is not point to argue about how you or me feel regarding a thing. Feelings are personal and are not debatable. The mission is not to please traders but to provide investable traders to investors. I want to sum up my position. It is also a defeat for DScore: they push traders to rate themselves with equity because DScore is not enough do distinguish skill from luck. It is not a fair rule but it is a necessary rule, because people isn't fair, too much people that has the money but prefer to "be smart" and keep it in their wallett.